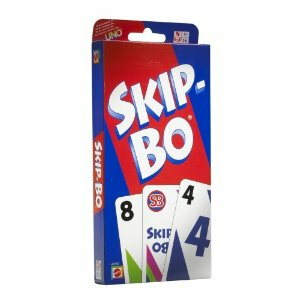 A member of Mattel's popular family of Uno card games, Skip-Bo resembles speed (or spit) in the same way that Uno takes after crazy eights. Out of a 162-card deck, two to six players are each dealt 20-card "stockpiles"; the first one to deplete their pile wins. Competing either alone or in teams, players draw from a central pile and stack their cards sequentially onto one of four "build" piles, using plentiful Skip-Bo wild cards to break up static situations. Deceptively simple and ingeniously designed, this classic game offers plenty of strategizing opportunities.